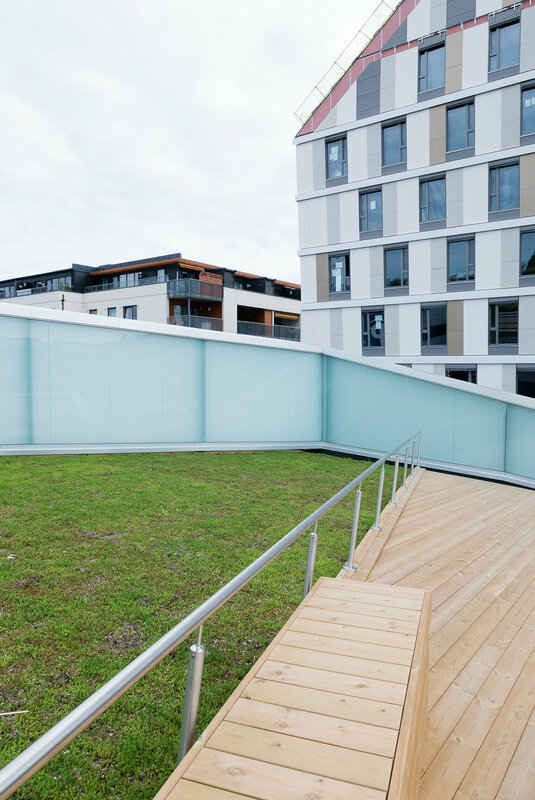 In this project, we helped a housing developer unlock the potential of a complex site in the beautiful neighbourhood of Nordstrand, in Oslo. Bringing together our skills in site analysis and visualisation, we designed and presented alternative development strategies for the site, helping the developer and the site owner to build architecture that is both inspiring and financially viable. Surrounding by elegant villas with fantastic views to Oslo Fjord, the undeveloped site had a complex topography, with a north-facing rocky slope dropping 11 meter drop across the site, overgrown with several large mature trees. This unusual configuration made the site unsuitable for standard off-the-shelf housing solutions. So the developer asked us to assess the viability of a development and to bring in some creative thinking to showcase the potential of the site to the site owner. Using available topographic information and photos, we started by creating a 3D model of the site landscape and its surrounding, which would serve as the basis for our analysis and presentation. 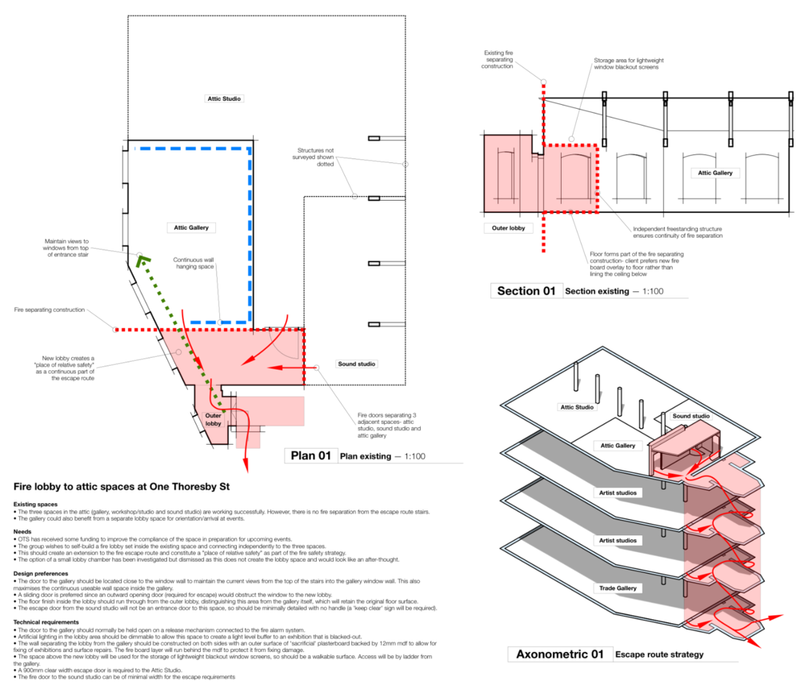 The various layers of planning regulations for the site were then analysed and compiled into a clear set of constraints applying to the project. The surrounding architectural context was also carefully taken into consideration, so that the development would not only integrated with the landscape, but also related meaningfully with the existing architectural language and scale of the residential area. Presenting these constraints visually, together with topographic and climatic data, we summarised a set of alternative scenarios for the development, each with the associated areas, possible building forms, parking and access requirements and consequences on the potential complexity of the planning process. With all information clearly summarised, the developer could easily review the options — weighing costs versus complexity of the required planning process — to select an optimal development scale matching his financial and marketing approach. With the project scale now clearly defined (in our case, three single family units), we proceeded with structuring the site and developed alternative architectural strategies based on this scenario. Our focus was on preserving the natural feel of the site, making the most of the existing topography and vegetation to create attractive outdoor spaces with extensive access to the sun for a large part of the year, despite the awkward orientation of the site. The dwellings were articulated around the different levels of the landscape to minimise groundworks on the site, preserve the existing trees and promote accessibility. 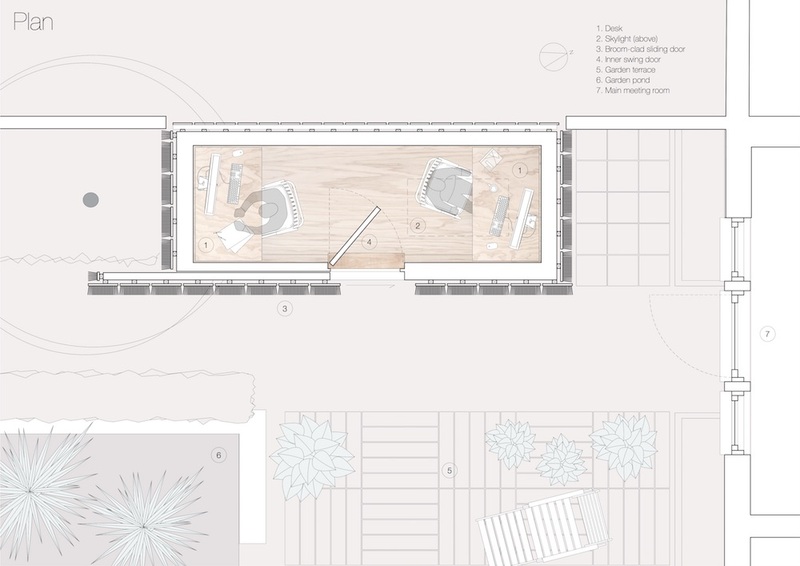 Their volumes were laid out to reduce self-shading of the garden areas, balancing open communal outdoor areas with more private garden spaces linked to each dwelling, framing view from the living spaces and preserving a feeling of privacy from neighbours. 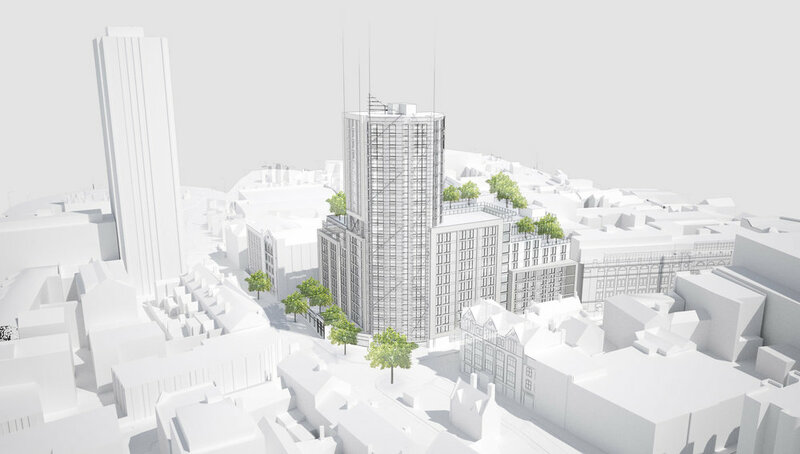 The result was five alternative architectural strategies that could be presented to the developer to the site owner. We organised our presentation around clear diagrams that visually summarised each strategy, with site plans, massing perspectives and outline dwelling organisations. 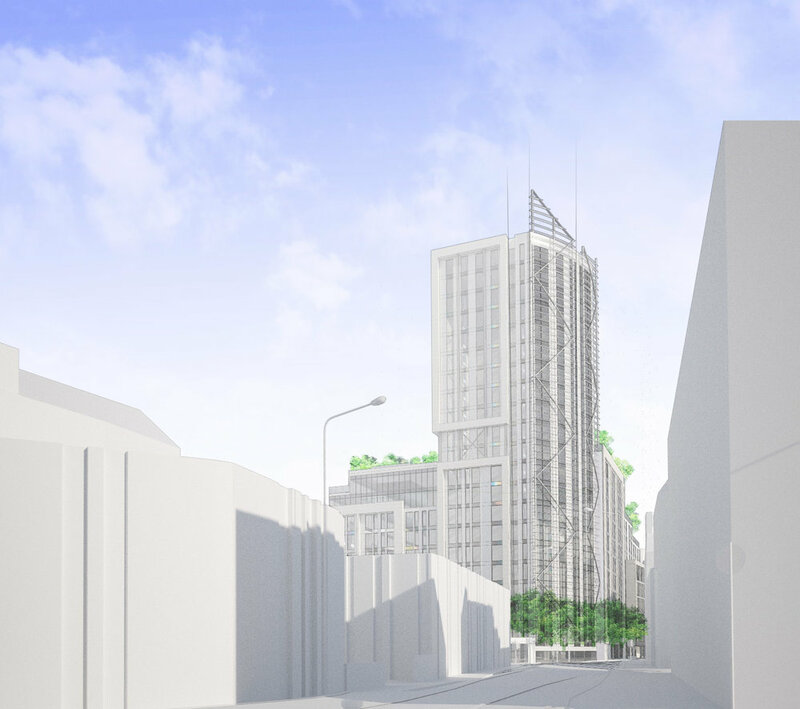 so that the site owner — who had no previous experience in development — could appreciate the potential of the site and take inform decisions about its future. 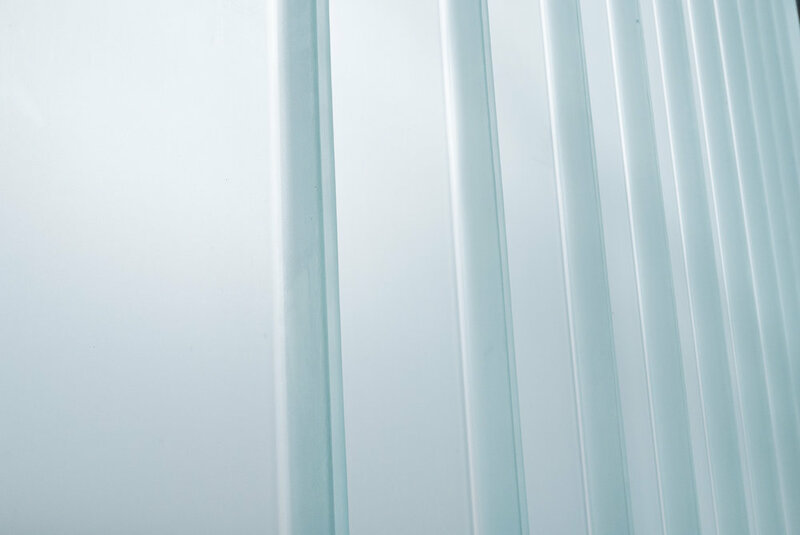 Some images from my photoshoot of the Colosseum Mann hospital, in Oslo, recently redesigned by the very talented team at Montaag, a multidisciplinary design studio based in Norway and California. I visited the North Nottinghamshire village of Maplebeck today with a group of 1st year students architecture from Nottingham Trent University. We were there to visit the New House, as guests of 2hD's wonderful clients Roger and Sue Bell. The students also visited the new Maplebeck village hall by Marsh Growchowski Architects and the nearby Hockerton Housing Project. 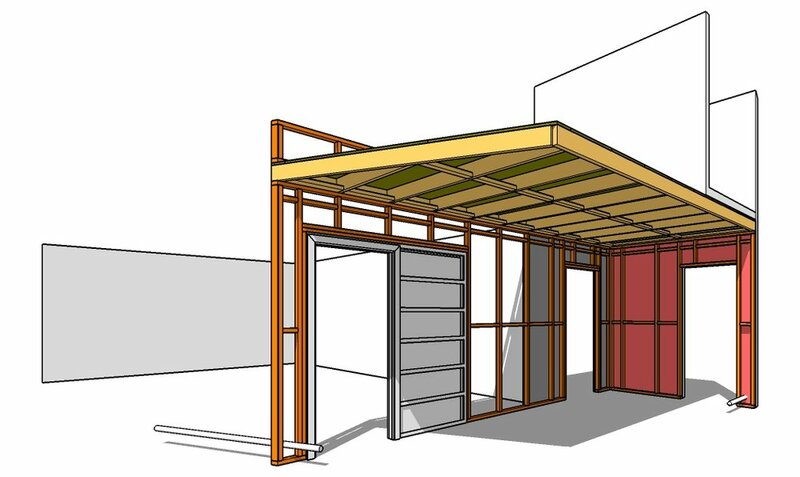 The students are learning about sustainable building design as part of their first year technical studies, so these three real-world low energy projects will be a boost to their understanding. For me personally it was great to return to Maplebeck and hear how well the house is working and how happy Roger and Sue are with the design. As the sun came out during the day we watched as the solar array pumped out nearly 7Kw of electricity, meeting the house's tiny energy demands with ease, charging the Tesla battery and exporting the excess to the National Grid. Perhaps the only sad point of the day was to reflect on how unusual low energy housing still is considered in the UK. When I was taught as an undergraduate student in the early 1990s by Brenda & Robert Vale, they were completing their own house in Southwell, itself the culmination of research dating back to their 1975 publication "The Autonomous House". Four decades after that book, and a quarter century after the autonomous house in Southwell, we are still looking to the NEXT generation of architects, builders and developers to make sustainable housing the norm rather than the exception. Let's hope today's visit has inspired some of the NTU students to integrate sustainable principles seamlessly into their creative processes! Kudos to Roger and Sue for hosting us, to Derek Sayer of the Maplebeck Village Hall committee for tours of that building and to Chris Marsh, my NTU colleague for arranging the visit. Architecture and art magazine designboom featured an article on their website about our new micro-office Mission Control. 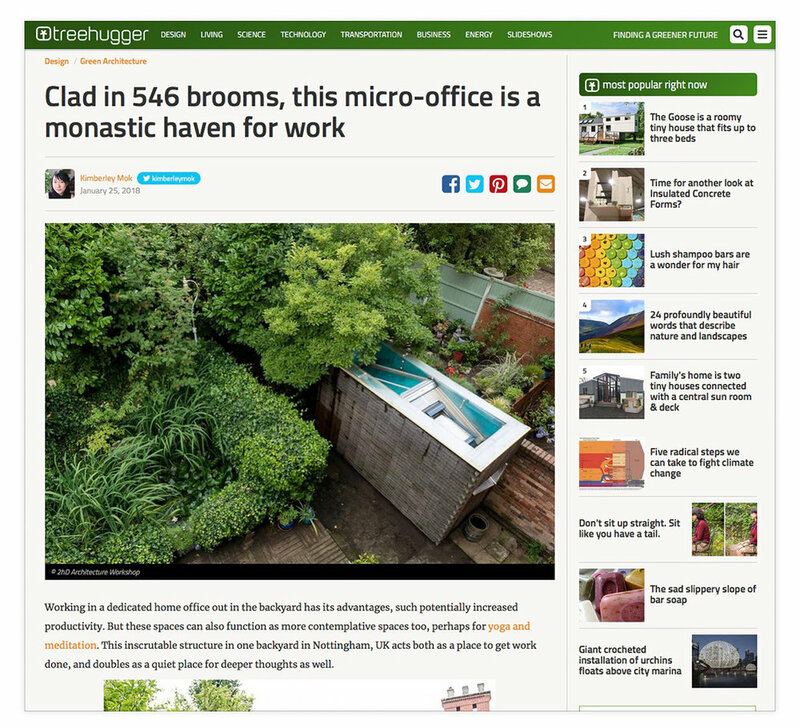 Another article about our experimental micro-office Mission Control was published today on ArchDaily. A client have just sent us some photos of the finished staircase we have designed for her house. 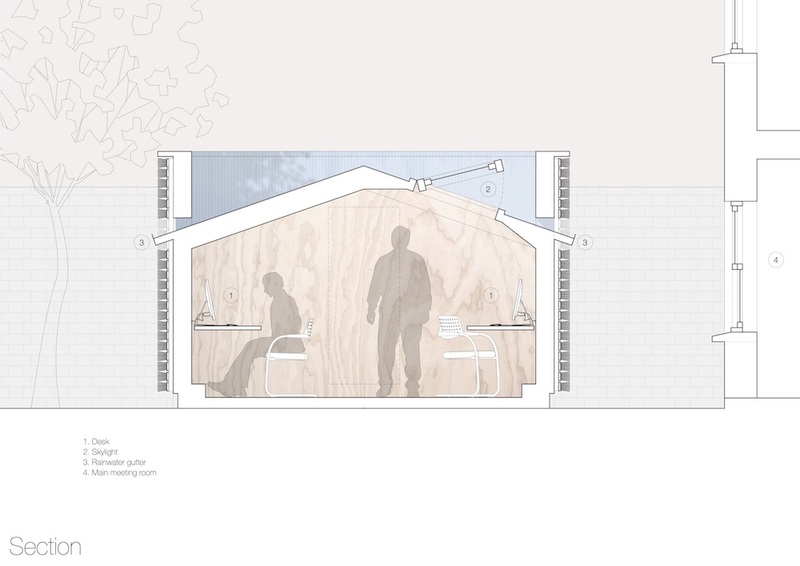 We designed this little structure to provide access from the upper terraces of the house down to the garden space. 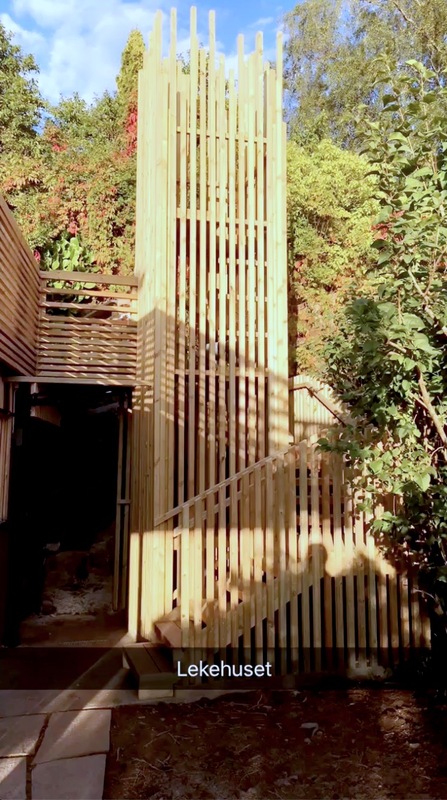 Since the garden was also a prime spot for children play, we designed the staircase wrapped around a “treehouse”, in which the children can hide and play, or take a fun shortcut climb back home! Some photos of our new experimental micro-office Mission Control, in all its broom-clad splendour! Crafting our micro-office Mission Control has been a great opportunity for us to experiment with many of the technologies we implement in our larger projects, such as natural materials, prefabrication, breathing construction and self-build techniques. Let's look back at how Mission Control was actually made. 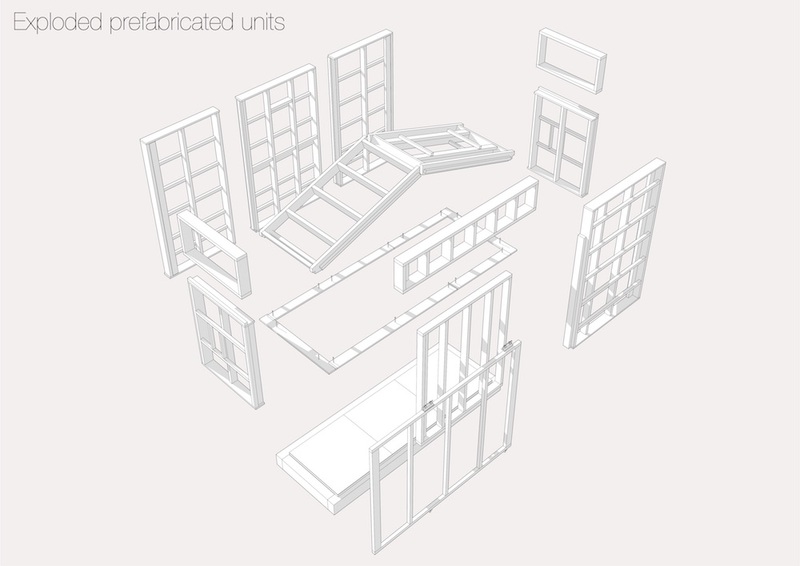 Each panel was designed so that its size and weight would allow two people (Tom and me) to carry it on site safely. 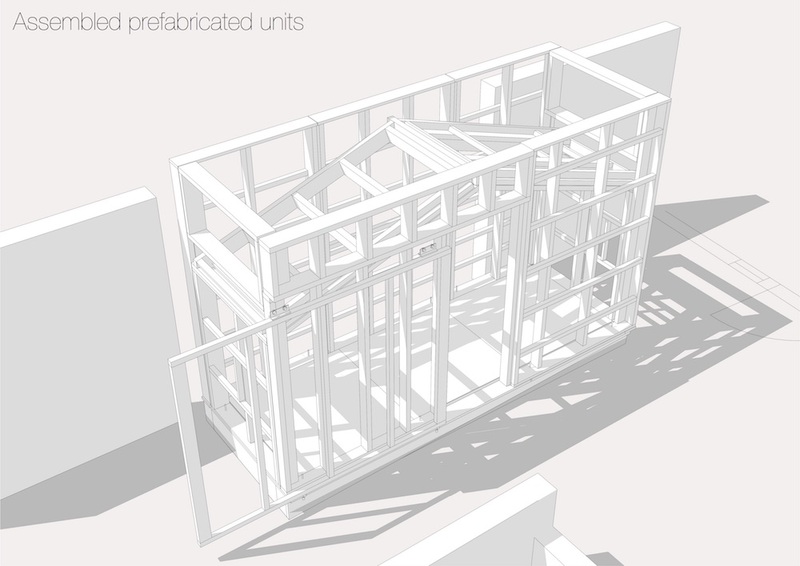 To simplify this, we created a small plugin for SketchUp to automatically check this as we modelled the structural panels, as well as to create detailed material lists and clear fabrication manuals for each module. Once fabricated, each module was connected on site to the existing foundations of the former garden shed and to its neighbouring panels. It was then insulated with natural sheep's wool insulation, which was a real treat to install. 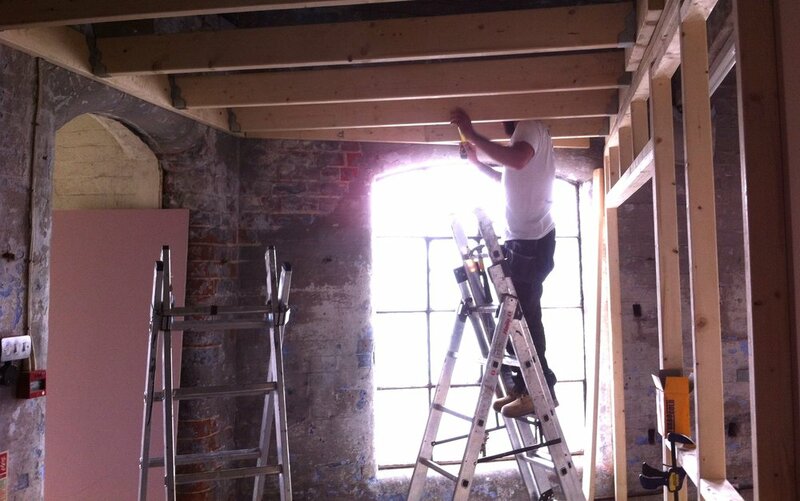 The whole assembly was finally wrapped in wood-fibre boards for weather-tightness, extra insulation and breathability. The interior climate is then simply regulated by natural ventilation (adjustable with vents in the door and skylight) and the heating provided by the waste heat produced by our computers. 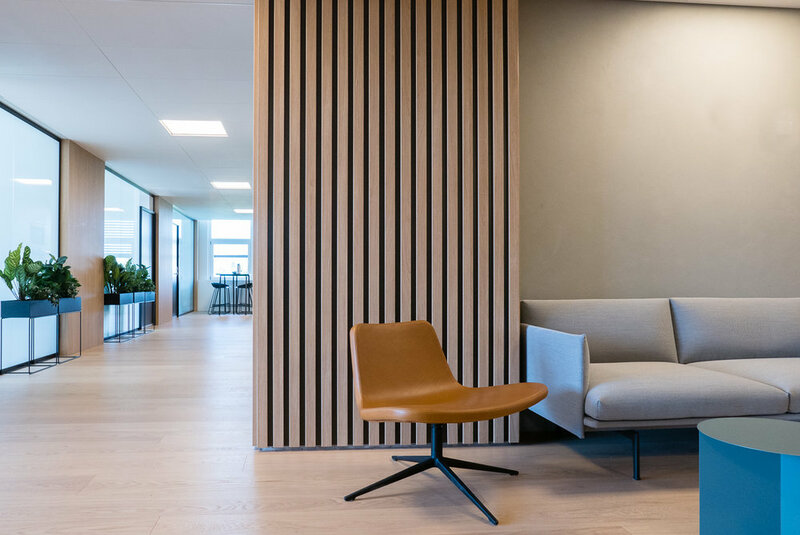 The whole wall construction is vapour-open, complementing the natural ventilation to maintain a healthy and comfortable environment inside. The outside of the enclosure was finally clad with a total of 546 wooden broom heads, with natural coco-fibre bristles, screwed to battens wrapping around the breathing walls. The selection of broom heads as a cladding material has been the result of a careful search for a material that would fulfil all our needs: a natural material with an interesting texture, readily available and affordable, friendly to the touch, yet resistant to break-ins by concealing any opening into the building. Broom heads actually proved a rather economical cladding materials, as well as creating beautiful shades of browns and greys that evolve with the seasons and ambient humidity, reminiscent of some traditional thatching techniques. Designing and crafting our micro-office Mission Control has been a long story: we started toying with the idea almost ten years ago! And it has sometimes been a frustrating one, especially when trying to fit this project between our other "more urgent" projects. But, in the end, this has been an immensely satisfying project and something we are very proud of — having converted our initial idea into an actual architectural space that we love and truly feel our own, every bit of it designed and crafted with our own hands. A project that embodies many of our ethical values and architectural sensibilities at 2hD Architecture Workshop. 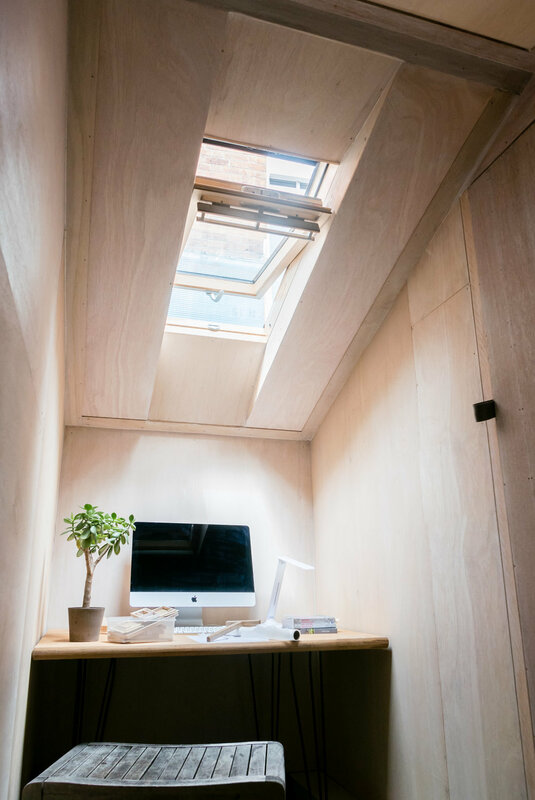 Nicknamed "Mission Control", our broom-clad micro-office is an exercise in teleportation, designed to take us from the everyday hurly burly to a another world — one of calm, quiet and focus. Our UK office was a home office — not squeezed in to a back bedroom but occupying a large ground floor room with direct access to the main entrance and the garden. For some years this served us well, but the arrival of children led inevitably to a loss of separation. As any home-working architect will testify, the room with all the paper and colouring pens is a kid magnet! 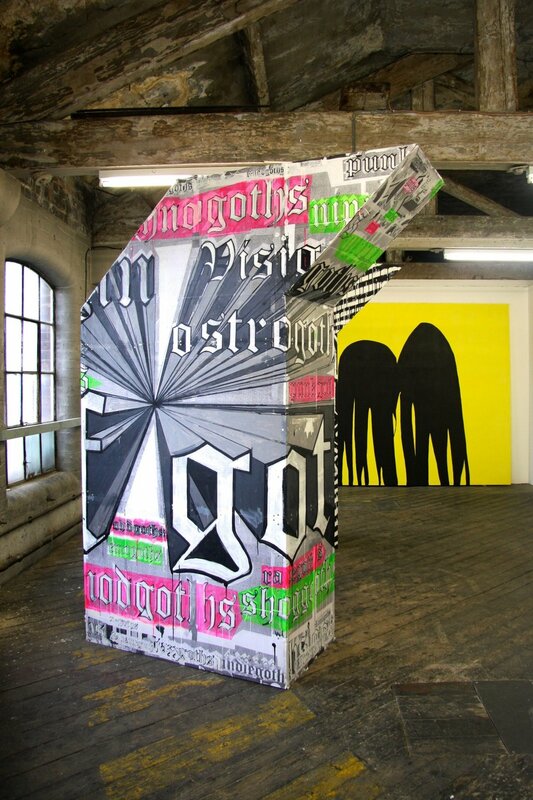 To some extent, the injection of informality improved things — collaborations became looser, more relaxed and more creative — but we were left with the need for a ‘cave’ to complement our increasingly lively ‘commons’. Our working practices have always involved two very distinct modes. The first is highly collaborative and semi-structured, requiring large surfaces, space and materials for analogue production of drawings and models. The second, as a counterpoint, requires periods of immersion in focussed digital design and production work. Our existing home office provided ideal conditions for the former, but creating the conditions for the latter was always extremely difficult. 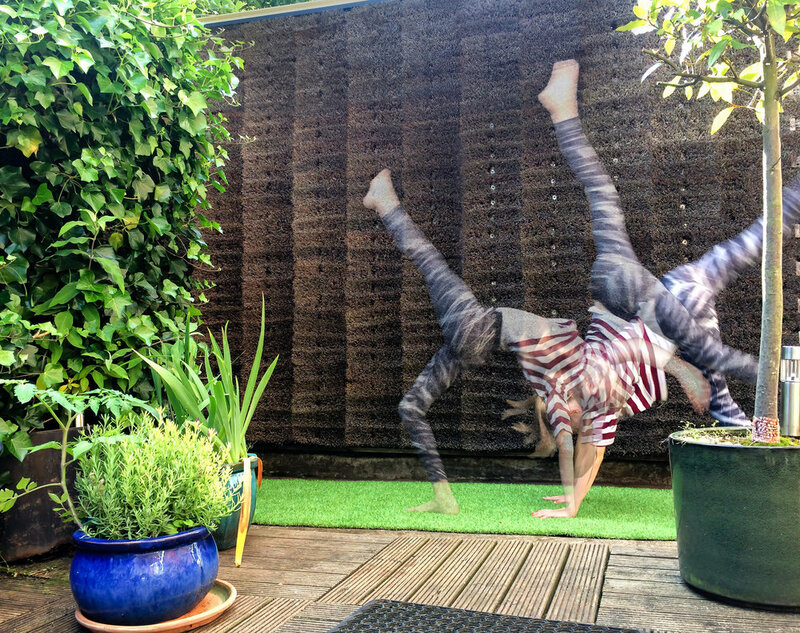 In the garden was glazed shed, built by the previous owner from repurposed corrugated iron, old windows, offcuts of vinyl and pieces of timber. Rickety in the extreme, we nevertheless blessed it with the name “Mission Control” because it was a great place to retreat to when setting off fireworks on bonfire night. We decided the replacement for this shed would become our garden office. The rise of the garden office has been met by a multitude of packaged solutions, and some truly wonderful bespoke designs. But nothing we could find in the market met our slightly odd needs. We also felt the urge to make, at 1:1 scale and with our own hands, something that we had designed from scratch. 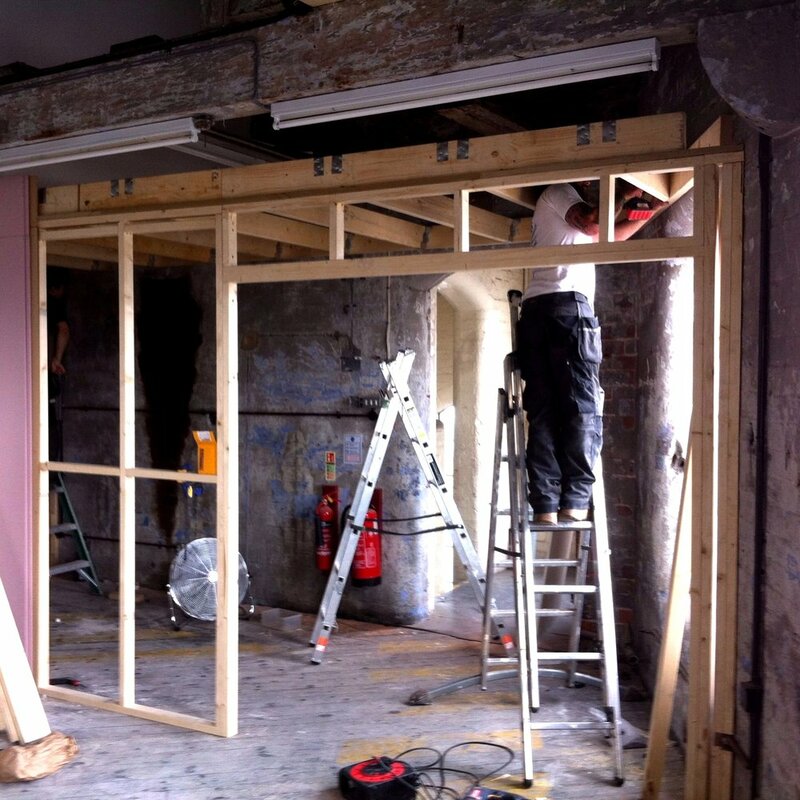 So we decided to embark on a highly personal journey into design and build. We designed Mission Control as a sort of antithesis of "the contemplation space with landscape views and flowing inside-outside space". We needed a cell, removed from physical context and worldly distraction, where we could retreat to immerse ourselves in brain work. 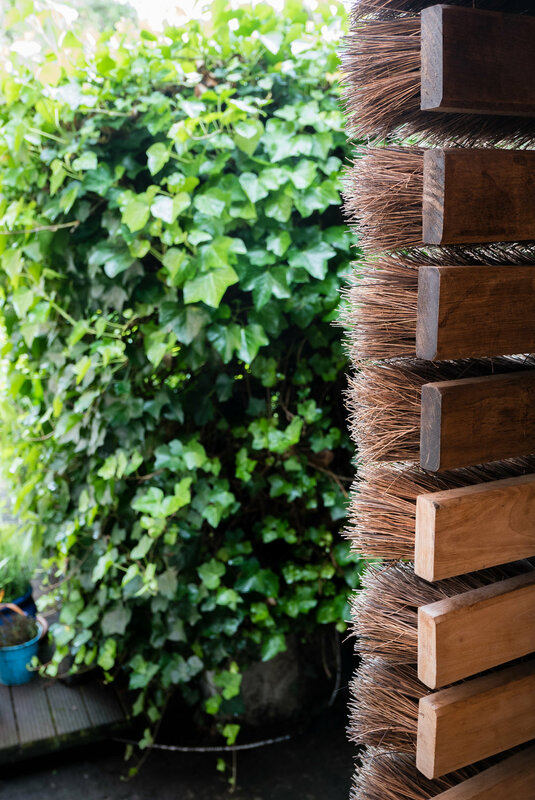 Without any visible door or window the outer facades are entirely clad in natural coco-fibre broom heads: details and junctions are largely concealed, as the broom bristles interlock to provide a continuous and visually diffuse surface. Thus giving no clue as to its status as occupied or empty, the structure existing merely as an object of intrigue. This is a reverse Tardis: much smaller on the inside than it appears from the outside. The difference in volumes results from the simple shed-like pitched roof hidden behind the parapet. 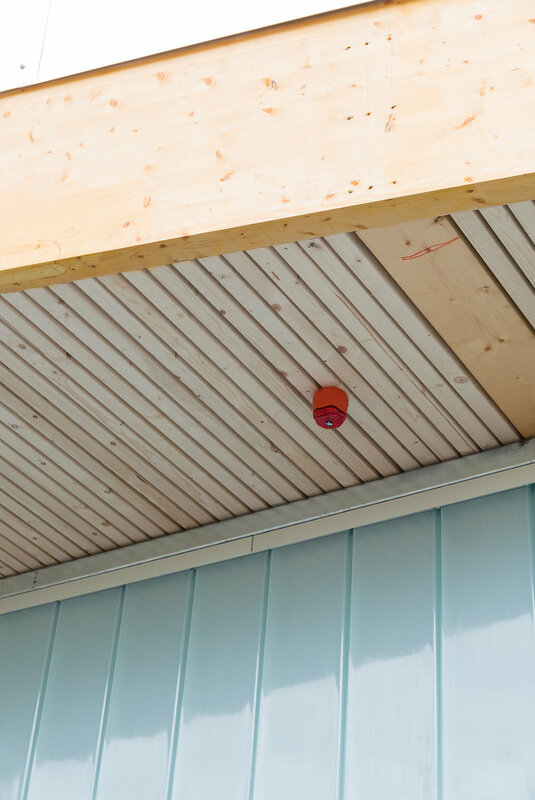 The polycarbonate surface of the roof only pops through the brush cladding to divert — yet eliminates familiar details like fascias and gutters, which would make the box readable as an archetypal shed or garden office. The space within is a comfortable and calm isolation chamber for undisturbed concentration. Two back-to-back desks are nested under the low ceilings, reminiscent of the containment created by the sloping ceiling of an artist’s garret. 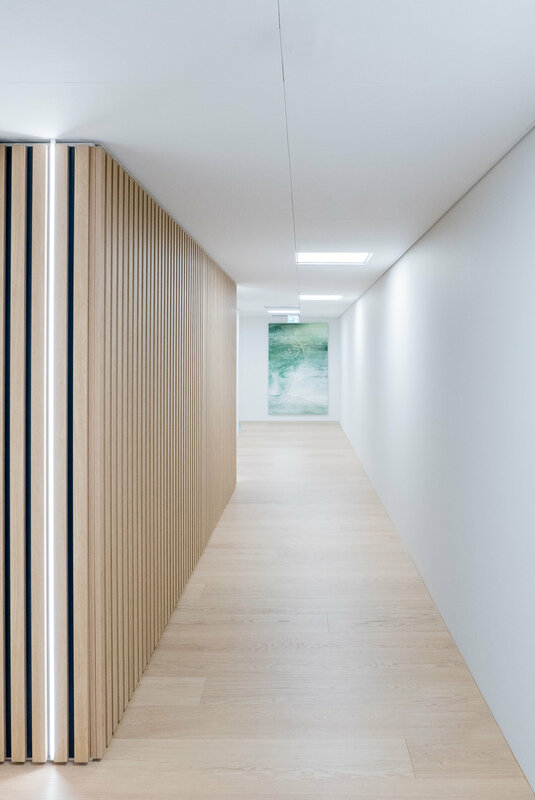 Interior walls and ceilings are clad with whitewashed plywood, which adds to the calm and natural feeling environment. The breathable walls, wrapped with sheep’s wool insulation, create a healthy internal environment that is easily heated by body warmth and waste heat from computers. Daylight and ventilation are provided by a single hidden skylight that perforates through the reflective roof surface. Commuting to work in Mission Control is an important symbolic process: the full experience of ‘going to work’ is here in condensed and enhanced form. Leaving the house, and travelling the 4 metre journey to the door of the office, provides just enough time to calm and focus. This is a little ritual that requires concentration and creates distance from whatever else is on your mind. As the door clunks shut behind you, the box seals itself and the separation is complete. Let focus begin. 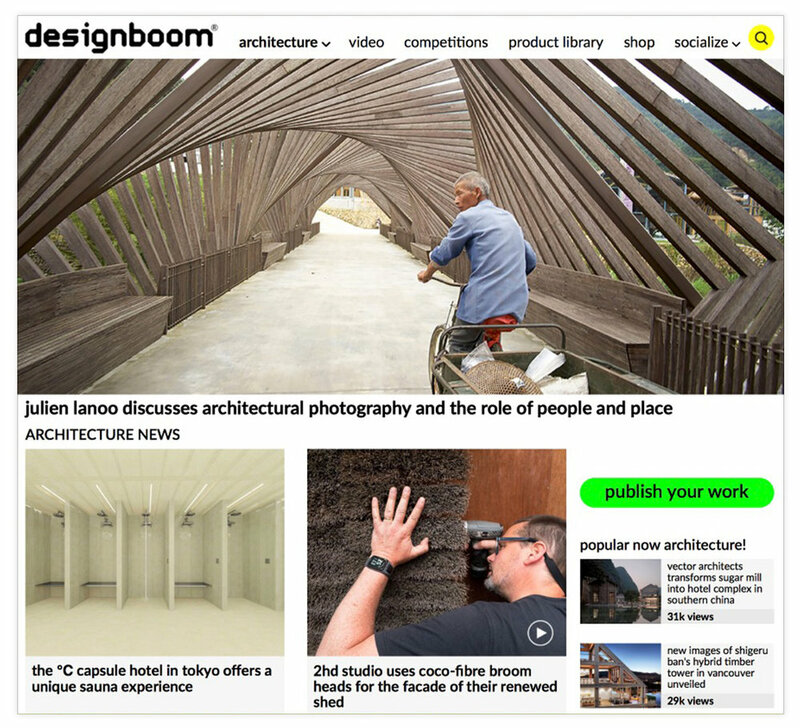 Update: Mission Control has been featured on architecture magazines and websites around the world, including ArchDaily, designboom, TreeHugger, New Atlas, inHabitat and Dwell. How to extend a 1930s 'Arts and Crafts' style detached house? One approach would be to mimic the original building, but that's not always the most sensitive or responsive solution. Our clients asked us to extend their house over a dilapidated single storey 'lean-to' garage, to provide a couple of new bedrooms. They also needed more ground floor space to connect properly with their garden. Looking at the street scene, it was immediately clear that development pattern was characterised by detached houses with relatively low-key side extensions, containing garages, porches and sheds. To extend with a typical two-storey pitched-roof building would change this pattern and detract from the prominence of the 1930s house. Instead we proposed a subservient, low pitched roof that would sit below the existing building's eaves and drop down into the slope of the land. 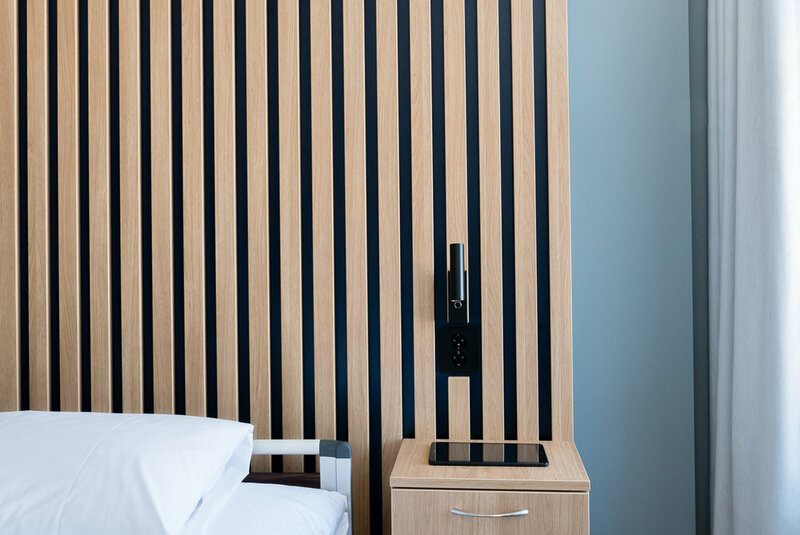 This would be clad in dark-stained vertical timber boarding, reminiscent of a number of 1930s modernist buildings - a different style but still contemporary with the original. Having consulted neighbours and the planning officer, we carefully explained this strategy through our planning application drawings and Design and Access Statement (DAS). 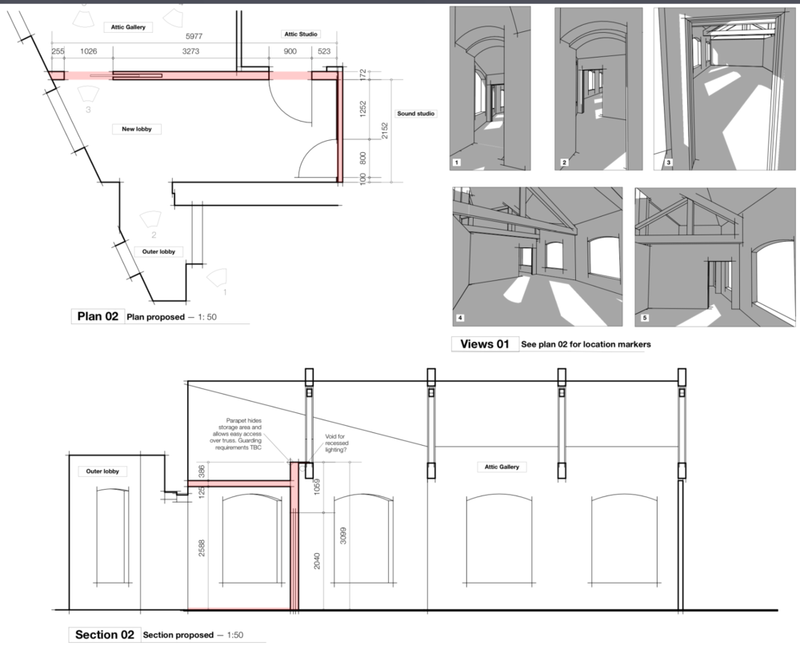 This latter document is often seen as a bit of a token gesture on small scale project like this, but we see it as an opportunity to explain the care we have taken in our design and the various options considered along the way. We were successfully able to make a case to go against the planning officer's pre-planning advice to use a pitched roof — it was a sensible suggestion and not one we rejected out of hand, but by careful analysis of the particular setting of this building we arrived at the conclusion that in this case, a pitched roof would not be the best way to go. The end result will be a sensitively designed contemporary extension that extends the living space and amenities of the home without impinging on the neighbours or detracting from the proud character of the original house. 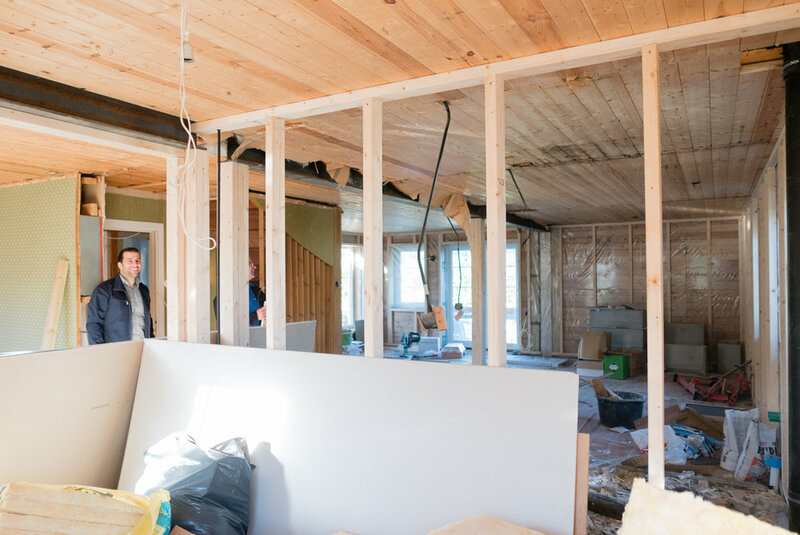 Our remodelling and extension of a a family house in Bærum is progressing well, with the structures of the new garage and extension completed, and the new insulated cladding and windows installed. The interior spaces have also been opened up, starting to reveal how the interior spaces will key into one another and into the garden. On my way back from a site visit in Eidsvoll, I did a pitstop at Lillestrøm station to take some photos of the new bicycle hotel designed by our fellow office workers Various Architects, who I collaborated with on several projects and competitions. A beautiful little building with a restrained, almost Japanese-like, palette of materials and a very nice sense of scale. Here are a few of my shots. Ideas about a new architecture project? Architecture is at the core of what we do and we can help you realise your project.